Scanner Over Ip - remote control / remote monitoring software for Uniden BC785/796 scanners. This software is used to control and monitor a scanning radio receiver over any network. 'Scanner Over Ip' uses state of the art technology like 'Voice over IP' / 'VoIP' and PCM and GSMcodecs digital sample and compression technology to stream audio over the network from the server to the client. 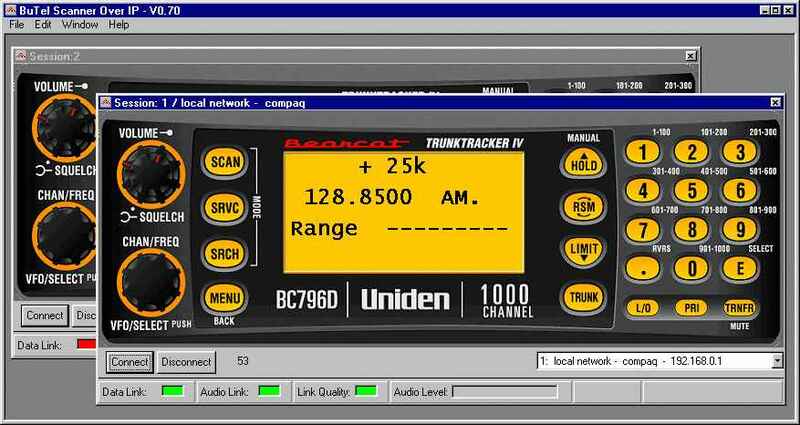 'Scanner Over Ip' offers a cheap but effective way of monitoring radio traffic and control a scanning radio (Uniden BC785/BC796) at any remote location worldwide. Unlike other software solutions 'Scanner Over IP' has build in audio streaming. Are you looking for a custom designed 'Scanner/voice over IP' solution for radio communication? Contact Scanner Master and maybe we can build the software for you. This software is designed for professional users that want to install scanners at remote locations and monitor radio traffic from a central point. If the network connection is the internet you can install scanners at remote locations worldwide! - Server must have static IP address and access to firewall/modems for NATP settings or dymamic IP with dymamic DNS service like tzo.com or dynip.com .